Does the Collatz sequence eventually reach 1 for all positive integer initial values? The Collatz conjecture is a conjecture in mathematics that concerns a sequence defined as follows: start with any positive integer n. Then each term is obtained from the previous term as follows: if the previous term is even, the next term is one half the previous term. If the previous term is odd, the next term is 3 times the previous term plus 1. The conjecture is that no matter what value of n, the sequence will always reach 1. Now form a sequence by performing this operation repeatedly, beginning with any positive integer, and taking the result at each step as the input at the next. That smallest i such that ai = 1 is called the total stopping time of n. The conjecture asserts that every n has a well-defined total stopping time. If, for some n, such an i doesn't exist, we say that n has infinite total stopping time and the conjecture is false. The sequence for n = 27, listed and graphed below, takes 111 steps (41 steps through odd numbers, in large font), climbing to a high of 9232 before descending to 1. 1, 2, 3, 6, 7, 9, 18, 25, 27, 54, 73, 97, 129, 171, 231, 313, 327, 649, 703, 871, 1161, 2223, 2463, 2919, 3711, 6171, … (sequence A006877 in the OEIS). less than 100 quadrillion is 93,571,393,692,802,302, which has 2091 steps. Note: these numbers are the lowest ones with the indicated step count, but not necessarily the only ones below the given limit. For instance, 9,780,657,631 has 1132 steps as well. times to reach one, and is never increased. Directed graph showing the orbits of small numbers under the Collatz map. The Collatz conjecture is equivalent to the statement that all paths eventually lead to 1. Directed graph showing the orbits of the first 1000 numbers. Any counterexample to the Collatz conjecture would have to consist either of an infinite divergent trajectory or a cycle different from the trivial (4; 2; 1) cycle. Thus, if one could prove that neither of these types of counterexample could exist, then all positive integers would have a trajectory that reaches the trivial cycle. Such a strong result is not known, but certain types of cycles have been ruled out. in a closed loop. For this shortcut definition, the only known cycle is (1; 2). Although 4 is part of the single known cycle for the original Collatz map, it is not part of the cycle for the shortcut map. A k-cycle is a cycle that can be partitioned into 2k contiguous subsequences: k increasing sequences of odd numbers alternating with k decreasing sequences of even numbers. For instance, if the cycle consists of a single increasing sequence of odd numbers followed by a decreasing sequence of even numbers, it is called a 1-cycle. Steiner (1977) proved that there is no 1-cycle other than the trivial (1;2). Simons (2004) used Steiner's method to prove that there is no 2-cycle. Simons & de Weger (2005) extended this proof up to 68-cycles: there is no k-cycle up to k = 68. Beyond 68, this method gives upper bounds for the elements in such a cycle: for example, if there is a 75-cycle, then at least one element of the cycle is less than 2385×250. Therefore, as exhaustive computer searches continue, larger cycles may be ruled out. To state the argument more intuitively: we need not look for cycles that have at most 68 trajectories, where each trajectory consists of consecutive ups followed by consecutive downs. See below for an idea of how one might find an upper bound for the elements of a cycle. Although the conjecture has not been proven, most mathematicians who have looked into the problem think the conjecture is true because experimental evidence and heuristic arguments support it. As of 2017[update], the conjecture has been checked by computer for all starting values up to 87 * 260. All initial values tested so far eventually end in the repeating cycle (4; 2; 1), which has only three terms. From this lower bound on the starting value, a lower bound can also be obtained for the number of terms a repeating cycle other than (4; 2; 1) must have. When this relationship was established in 1981, the formula gave a lower bound of 35,400 terms. This computer evidence is not a proof that the conjecture is true. As shown in the cases of the Pólya conjecture, the Mertens conjecture, and Skewes' number, sometimes a conjecture's only counterexamples are found when using very large numbers. And even if the probabilistic reasoning were rigorous, this would still imply only that the conjecture is almost surely true for any given integer, which does not necessarily imply that it is true for all integers. 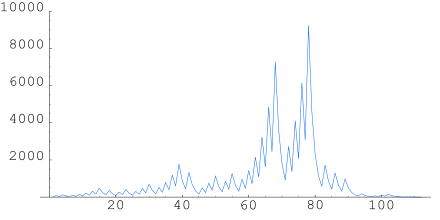 Although it is not known rigorously whether all positive numbers eventually reach one according to the Collatz iteration, it is known that many numbers do so. In particular, Krasikov and Lagarias showed that the number of integers in the interval [1,x] that eventually reach one is at least proportional to x0.84. The first 21 levels of the Collatz graph generated in bottom-up fashion. The graph includes all numbers with an orbit length of 21 or less. So, instead of proving that all positive integers eventually lead to 1, we can try to prove that 1 leads to all positive integers. For any integer n, n ≡ 1 (mod 2) iff 3n + 1 ≡ 4 (mod 6). Equivalently, (n − 1)/3 ≡ 1 (mod 2) iff n ≡ 4 (mod 6). Conjecturally, this inverse relation forms a tree except for the 1–2–4 loop (the inverse of the 4–2–1 loop of the unaltered function f defined in the Statement of the problem section of this article). For any integer n, n ≡ 1 (mod 2) iff (3n + 1)/2 ≡ 2 (mod 3). Equivalently, (2n − 1)/3 ≡ 1 (mod 2) iff n ≡ 2 (mod 3). Conjecturally, this inverse relation forms a tree except for a 1–2 loop (the inverse of the 1–2 loop of the function f(n) revised as indicated above). ). Then in binary, the number n can be written as the concatenation of strings wk wk−1 … w1 where each wh is a finite and contiguous extract from the representation of 1/3h. The representation of n therefore holds the repetends of 1/3h, where each repetend is optionally rotated and then replicated up to a finite number of bits. It is only in binary that this occurs. Conjecturally, every binary string s that ends with a '1' can be reached by a representation of this form (where we may add or delete leading '0's to s). Remove all trailing "0"s (i.e. repeatedly divide by two until the result is odd). This prescription is plainly equivalent to computing a Hailstone sequence in base two. This can be done because when n is odd, 3n + 1 is always even. If P(…) is the parity of a number, that is P(2n) = 0 and P(2n + 1) = 1, then we can define the Hailstone parity sequence (or parity vector) for a number n as pi = P(ai), where a0 = n, and ai+1 = f(ai). What operation is performed (3n + 1)/2 or n/2 depends on the parity. The parity sequence is the same as the sequence of operations. Using this form for f(n), it can be shown that the parity sequences for two numbers m and n will agree in the first k terms if and only if m and n are equivalent modulo 2k. This implies that every number is uniquely identified by its parity sequence, and moreover that if there are multiple Hailstone cycles, then their corresponding parity cycles must be different. Applying the f function k times to the number n=a·2k + b will give the result a·3c + d, where d is the result of applying the f function k times to b, and c is how many increases were encountered during that sequence (e.g. for a·25 + 1 there are 3 increases as 1 iterates to 2, 1, 2, 1, and finally to 2 so the result is a·33+2; for a·22 + 1 there is only 1 increase as 1 rises to 2 and falls to 1 so the result is a·3 + 1). When b is 2k - 1 then there will be k rises and the result will be 2·a·3k - 1. The factor of 3 multiplying a is independent of the value of a; it depends only on the behavior of b. This allows one to predict that certain forms of numbers will always lead to a smaller number after a certain number of iterations, e.g. 4a + 1 becomes 3a + 1 after two applications of f and 16a + 3 becomes 9·a + 2 after 4 applications of f. Whether those smaller numbers continue to 1, however, depends on the value of a. The Collatz conjecture equivalently states that this tag system, with an arbitrary finite string of a's as the initial word, eventually halts (see Tag system#Example: Computation of Collatz sequences for a worked example). Odd values are listed in large bold. Each cycle is listed with its member of least absolute value (which is always odd) first. The generalized Collatz conjecture is the assertion that every integer, under iteration by f, eventually falls into one of the four cycles above or the cycle 0 → 0. The 0 → 0 cycle is often regarded as "trivial" by the argument, as it is only included for the sake of completeness. The standard Collatz map can be extended to (positive or negative) rational numbers which have odd denominators when written in lowest terms. The number is taken to be odd or even according to whether its numerator is odd or even. A closely related fact is that the Collatz map extends to the ring of 2-adic integers, which contains the ring of rationals with odd denominators as a subring. And this is because the 8-element parity sequence actually represents two circuits of the loop cycle defined by the 4-element parity sequence. In this context, the Collatz conjecture is equivalent to saying that (0 1) is the only cycle which is generated by positive whole numbers (i.e. 1 and 2). Eq. (1) also gives a rough idea about how one can prove that cycles of certain lengths do not exist. For a hypothetical cycle of length n, the numerator is bounded above by 3n - 2n (this corresponds to a cycle of all odd numbers). A lower bound for the denominator can be obtained by letting n/m be an optimal rational approximation to log(3)/log(2). Together these give an upper bound for the unique fraction that generates a cycle of length n. If this upper bound is smaller than the largest number for which the conjecture has been verified to hold, then a cycle of length n is impossible. Iterating the above optimized map in the complex plane produces the Collatz fractal. The point of view of iteration on the real line was investigated by Chamberland (1996), and on the complex plane by Letherman, Schleicher, and Wood (1999). f k(a 2k + b) = a 3c(b) + d(b). This requires 2k precomputation and storage to speed up the resulting calculation by a factor of k, a space–time tradeoff. holds for all a, then the first counterexample, if it exists, cannot be b modulo 2k. For instance, the first counterexample must be odd because f(2n) = n, smaller than 2n; and it must be 3 mod 4 because f2(4n + 1) = 3n + 1, smaller than 4n + 1. For each starting value a which is not a counterexample to the Collatz conjecture, there is a k for which such an inequality holds, so checking the Collatz conjecture for one starting value is as good as checking an entire congruence class. As k increases, the search only needs to check those residues b that are not eliminated by lower values of k. Only an exponentially small fraction of the residues survive. For example, the only surviving residues mod 32 are 7, 15, 27, and 31. (sequence A075677 in the OEIS). In 1972, J. H. Conway proved that a natural generalization of the Collatz problem is algorithmically undecidable. -complete. This hardness result holds even if one restricts the class of functions g by fixing the modulus P to 6480. This volume, edited by Jeffrey Lagarias and published by the American Mathematical Society, is a compendium of information on the Collatz conjecture, methods of approaching it and generalizations. It includes two survey papers by the editor and five by other authors, concerning the history of the problem, generalizations, statistical approaches and results from the theory of computation. It also includes reprints of early papers on the subject (including an entry by Lothar Collatz). ^ O'Connor, J.J.; Robertson, E.F. (2006). "Lothar Collatz". St Andrews University School of Mathematics and Statistics, Scotland. ^ Maddux, Cleborne D.; Johnson, D. Lamont (1997). Logo: A Retrospective. New York: Haworth Press. p. 160. ISBN 0-7890-0374-0. The problem is also known by several other names, including: Ulam's conjecture, the Hailstone problem, the Syracuse problem, Kakutani's problem, Hasse's algorithm, and the Collatz problem. ^ a b c d e Lagarias, Jeffrey C. (1985). "The 3x + 1 problem and its generalizations". The American Mathematical Monthly. 92 (1): 3–23. JSTOR 2322189. ^ According to Lagarias (1985), p. 4, the name "Syracuse problem" was proposed by Hasse in the 1950s, during a visit to Syracuse University. ^ Pickover, Clifford A. (2001). Wonders of Numbers. Oxford: Oxford University Press. pp. 116–118. ISBN 0-19-513342-0. ^ "Hailstone Number". MathWorld. Wolfram Research. ^ Hofstadter, Douglas R. (1979). Gödel, Escher, Bach. New York: Basic Books. pp. 400–2. ISBN 0-465-02685-0. ^ Guy, Richard K. (2004). ""E17: Permutation Sequences"". Unsolved problems in number theory (3rd ed.). Springer-Verlag. pp. 336–7. ISBN 0-387-20860-7. Zbl 1058.11001. ^ Guy, R. K. (1983). "Don't try to solve these problems". Amer. Math. Monthly. 90: 35–41. doi:10.2307/2975688. JSTOR 2975688. By this Erdos means that there aren't powerful tools for manipulating such objects. ^ Lagarias, Jeffrey C., ed. (2010). The ultimate challenge: the 3x+1 problem. Providence, R.I.: American Mathematical Society. p. 4. ISBN 0821849409. ^ Leavens, Gary T.; Vermeulen, Mike (December 1992). "3x+1 Search Programs". Computers & Mathematics with Applications. 24 (11): 79–99. doi:10.1016/0898-1221(92)90034-F.
^ a b c Simons, J.; de Weger, B. (2003). 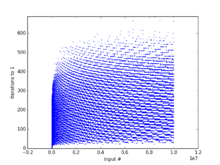 "Theoretical and computational bounds for m-cycles of the 3n + 1 problem" (PDF). Acta Arithmetica. 117 (1): 51–70. Bibcode:2005AcAri.117...51S. doi:10.4064/aa117-1-3. ^ Steiner, R. P. (1977). "A theorem on the syracuse problem". Proceedings of the 7th Manitoba Conference on Numerical Mathematics. pp. 553–9. MR 0535032. ^ Simons, John L. (2005). "On the nonexistence of 2-cycles for the 3x+1 problem". Math. Comp. 74: 1565–72. doi:10.1090/s0025-5718-04-01728-4. MR 2137019. ^ Roosendaal, Eric. "On the 3x+1 Problem". Retrieved 6 June 2018. ^ a b c Garner, Lynn E. "On The Collatz 3n + 1 Algorithm" (PDF). Retrieved 27 March 2015. ^ Lagarias (1985), section "A heuristic argument". ^ Krasikov, Ilia; Lagarias, Jeffrey C. (2003). "Bounds for the 3x + 1 problem using difference inequalities". Acta Arithmetica. 109 (3): 237–258. arXiv:math/0205002. Bibcode:2003AcAri.109..237K. doi:10.4064/aa109-3-4. MR 1980260. ^ Colussi, Livio (9 September 2011). "The convergence classes of Collatz function". Theoretical Computer Science. 412 (39): 5409–5419. doi:10.1016/j.tcs.2011.05.056. ^ Hew, Patrick Chisan (7 March 2016). "Working in binary protects the repetends of 1/3h: Comment on Colussi's 'The convergence classes of Collatz function'". Theoretical Computer Science. 618: 135–141. doi:10.1016/j.tcs.2015.12.033. ^ Chamberland, Marc (1996). "A continuous extension of the 3x + 1 problem to the real line". Dynam. Contin. Discrete Impuls Systems. 2 (4): 495–509. ^ Letherman, Simon; Schleicher, Dierk; Wood, Reg (1999). "The (3n + 1)-Problem and Holomorphic Dynamics". Experimental Mathematics. 8 (3): 241–252. doi:10.1080/10586458.1999.10504402. ^ Lagarias (1985), Theorem D.
^ Lagarias, Jeffrey C., ed. (2010). The Ultimate Challenge: the 3x+1 problem. American Mathematical Society. ISBN 978-0-8218-4940-8. Zbl 1253.11003. Keith Matthews' 3x + 1 page: Review of progress, plus various programs. Distributed computing (BOINC) project that verifies the Collatz conjecture for larger values. An ongoing distributed computing project by Eric Roosendaal verifies the Collatz conjecture for larger and larger values. Another ongoing distributed computing project by Tomás Oliveira e Silva continues to verify the Collatz conjecture (with fewer statistics than Eric Roosendaal's page but with further progress made). Weisstein, Eric W. "Collatz Problem". MathWorld. Nochella, Jesse. "Collatz Paths". 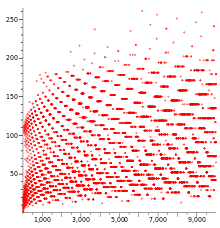 Wolfram Demonstrations Project.